The roots of rocketry lie so deep in the history of human civilization that it is believed to be impossible to mark the exact birth date of these ancient machines. Apparently, the first rockets owe their origin to the invention of gunpowder in China around the 10th Century AD. The earliest historical records testify that in 1232 AD, during the siege of Beijing (according to another source (102): town of Kai-fung-fu or Kai'feng) by the Mongols, the city's defenders fired missiles. It is believed that around the 13th Century, knowledge of rocketry reached Italy and France. The use of rockets near the Ukrainian city of Belgorod is recorded in 1516 and the first appearance of rockets in the Russian city of Ustuyg dates from around 1675. (2) Following the development and use of military missiles in Europe, the "Rocket Enterprise" (Raketnoe Zavedenie) was reportedly founded in Moscow around 1680. In 1815, Russian artillery engineer Alexander Zasyadko (1779-1837) started the development of battlefield missiles for the Russian army. Zasyadko conducted numerous test firings of experimental missiles, developed techniques for mass production of rockets and led the formation of the first missile unit in the Russian army around 1827. Three types of battlefield missiles (2-, 2.5- and 4-inch caliber) developed by Zasayadko had a range of between 1,600 and 2,700 meters. Zasyadko's written work, dated 1817, became the first Russian production and application manual for battlefield missiles. In 1849, another artillery engineer -- Konstantin Konstantinov -- took charge of the St. Petersburg-based "Rocket Enterprise" founded along with several similar European organizations in 1820s. Rockets developed by Konstantinov had a range of 4-5 kilometers. Konstantinov also proposed to use rockets to shoot the harpoons used in whaling. Konstantinov spent 1857 and 1858 in Europe, studying rocketry. During 1859-1861, back in Russia, Konstantinov delivered lectures on rocketry to military officers. A Russian artillery expert Mikhail Pomortsev actively experimented with rockets at the turn of the 20th century. Between 1902 and 1905, struggling to improve the accuracy of missiles, Pomortsev tested around 20 types of aerodynamic stabilizers on rockets. By 1908, Pomortsev's rockets reached a range of 8-9 kilometers. In Russia, the idea of using rocket propulsion for atmospheric flight was reportedly expressed in the mid-1800s by I. Tretesky, N. Sokovnin and N. Teleshev. However, the most famous proposal of this sort was made by Nikolai Kibalchich, an explosives technician from the radical antigovernment organization "Narodnaya Volya". In 1881, during his 17-day incarceration in the Petrapavloskaya Fortress, St. Petersburg, where he was awaiting execution for his part in the assassination of Emperor Alexander II, Kibalchich sketched and described a manned flight vehicle propelled by a solid-fuel engine. "While in prison, a few days before my death, I write this project," Kibalchich wrote, "I believe in the reality of my idea and this belief supports me in my terrible situation... If my idea ... is recognized as emplementable, I will be happy with the fact that I have made a huge favor to my native land and to humanity." In his work, Kibalchich asked a rhetorical question: "What kind of force is applicable to aeronautics. Such force, I believe, is slowly burning explosives." Kibalchich sketched a hollow metal cylinder with a hole at the bottom. "If the cylinder faces upward with its closed end, then with a certain pressure of the exhaust ... the cylinder should take off." Two days, before his execution, on March 31, 1881, Kibalchich made an official request to the minister of internal affairs to evaluate his proposal. The request asked for "issuance of a command on permitting an interview with a member of the committee in regard to this project ... or obtaining a written answer from a commission of experts." However, Kibalchich's project fell victim to political stigma, tarnishing its author's name. "To give this to scientists for examination will hardly be timely, and may evoke only inappropriate comments," read the note on the package containing the project. The work was put in archives, where it remained untouched until August 1917 -- the year of two Russian revolutions, which toppled the centuries-old Tsarist rule and brought the Bolsheviks to power. In March 1918, Nikolai Rynin, a restless propagandist of astronautics, got hold of Kibalchich's manuscript. With Rynin's review, Kibalchich's description of a manned rocket ship appeared in the April 1918 issue of the Byloye ("The Past") magazine. In the meantime, advances in artillery which had made their way into European armies by 1860s undermined military applications of rocketry and after a relatively short reign during the 19th century battlefield missiles became all but extinct. However, efforts to advance military rocketry were renewed after the invention of smokeless gunpowder in 1884. (120) A Russian artillery expert, Mikhail Pomortsev (1851-1916), actively experimented with rockets at the turn of the 20th century. Circa 850 AD: The Chinese use some form of gunpowder in making fireworks to celebrate religious festivals. 1242: Roger Bacon, an English Franciscan monk, records a secret formula for "gunpowder": saltpetre 41.2; charcoal 29.4; sulphur 29.4. To achieve a faster rate of burning, Bacon distills saltpeter -- the oxygen producing ingredient. The original formula apparently came from China. 1280: Al-Hasan al-Rammah, a Syrian military historian, describes rockets (Chinese arrows) and recipes for making gunpowder in "The Book of Fighting on Horseback and With War Engines." 1379: Gunpowder rockets are used in the siege of Chioggia, near Venice, Italy. 1621: In Russia, Anisim Mikhailov, a monk of the Ambassador Directorate, completes "The instruction of battle, artillery and other affairs dealing with military science," which describes rockets. 1657: Cyrano de Bergerac publishes Histoire Comiquie Contenant les Etats et Empires de la Lune. 1685: The "Rocket Enterprise" (Raketnoe Zavedenie) is founded in Moscow. 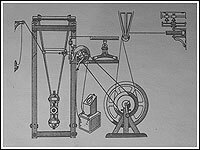 1687: Isaac Newton postulates the Laws of Motion, including his third law which states that "for every action there is an equal and opposite reaction." It becomes the main theoretical principle of jet propulsion. 1780s: Indian ruler Hyder Ali, Prince of Mysore, uses iron-cased rockets with 8-10-feet (2.4 - 3-meter) balancing sticks against troops of the East India Company. The rockets with a weight of 2.7 - 5.4 kilograms have a range of 2.4 kilometers. 1785: First balloon crosses the English Channel. 1804: Colonel William Congreve provides specifications for the manufacturing of large rockets at Woolwich, England. Within a year, he produces a 10.9-kilogram rocket with a 1,830-meter range. Later, he develops 14.5-kilogram iron-cased rockets (107 centimeters long and 10-centimeters in diameter). To increase the range, Congreve creates a faster-burning powder. 1806 Oct. 8: 18 British rocket-carrying boats bombard Boulogne (France) with Congreve missiles during the Napoleonic War. Most missiles overshoot the French battleships, instead starting fires in the coastal town. 1807 Sept. 2-7: British rocket boats attack Copenhagen, Denmark, initiating big fires in the city. 1813: The British Royal Military Academy in Woolwich publishes "A Treatise on the Motion of Rockets" by William Moore. The work includes a mathematical description of rocket trajectories, including their movement in air and in vacuum. 1814 Sept. 13-14: The British navy fires Congreve rockets against besieged Fort McHenry, Baltimore, during the War of 1812. The events inspire Francis Scott Key to write the Star Spangled Banner, which became the American national anthem. The song mentions "the rockets' red glare." 1827 Aug. 29: The Russian army uses rockets in the Battle of Ushagan during the Second Russian-Iranian war. 1828-29: The Russian Army uses Zasyadko rockets during the Russo-Turkish War. 1840: In England, William Hale, develops spin stabilized rockets, by placing three curved metal vanes in the rocket exhaust. The devices were employed during the Mexican War (1846-48), during the Crimean War (1853-56), in Hungary, Italy, Prussia, and during the American Civil War (1861-65). 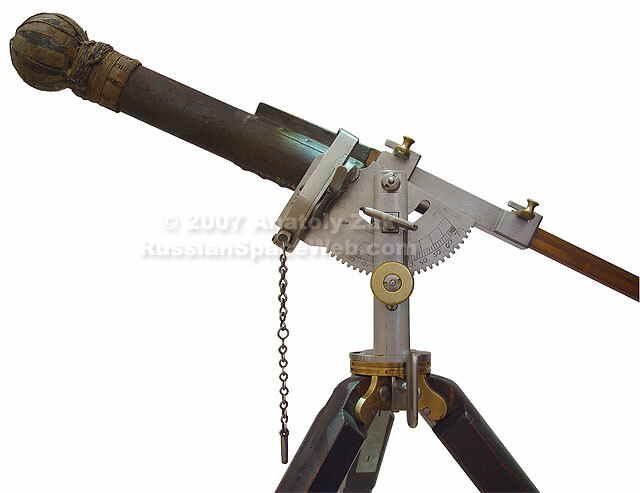 1853 May 2: Konstantin Konstantinov completes the development of a "ballistic pendulum" for rocket testing. 1853-56: Russian ships are equipped with rockets during the Crimean War. 1865: Jules Verne's science fiction novel De la Terre à la Lune ("From the Earth to the Moon") is published, predicting many aspects of space flight. 1866: In Russia, Nikolai Sokovnin proposes an airship propelled by a jet engine, which uses compressed air. 1878: Konstantin Tsiolkovsky writes down what is believed to be his first known note on space exploration in his "Ryzan notebook." 1881: While waiting to be executed for his part in the plot to assassinate Czar Alexander II, Nikolai Kibalchich sketches and describes a manned flight vehicle propelled by a solid-fuel engine. 1891: Ludwig Rohrmann patents a rocket system. 1895: Percival Lowell publishes book entitled Mars. A 1964 Soviet post stamp, dedicated to Nikolai Kibalchich, featured his sketch of a rocket ship (top right). Reproduced from a copy in Anatoly Zak's collection.